Skywatchers in Europe have snapped some of the final photos of a doomed German satellite slated to plunge to Earth this weekend in an uncontrolled death dive. The photos show the defunct 21-year-old Roentgen Satellite, or ROSAT, as the spacecraft spent its final days in orbit. The 2.7-ton ROSAT is expected to fall to Earth sometime between Saturday afternoon or Sunday morning (Oct. 22 or 23), but scientists cannot predict exactly when or where the satellite will be when it begins its fiery plunge through Earth's atmosphere. During ROSAT's last days in space, skywatchers around the world have trained their eyes — as well as cameras and telescopes — on the satellite. 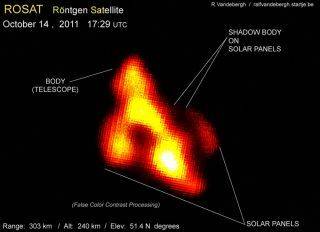 Veteran satellite spotter Ralf Vandebergh in the Netherlands has been keeping a close tabs on ROSAT using a camera-equipped telescope, and even snapped a photo for SPACE.com this week that showed the satellite's body and solar panels. ROSAT, Vandebergh said, has been a bit harder to observe than NASA's school bus-size Upper Atmosphere Research Satellite (UARS), which also fell to Earth last month. NASA's UARS satellite was a huge object weighing nearly 6.5 tons. ROSAT is smaller, weighing about 2.7 tons. "ROSAT is a rather difficult object in the telescope, due its relatively small size," Vandebergh said. "Details are therefore much harder to photograph than, for example UARS." Another skywatcher who spotted ROSAT is Marco Langbroek, who snapped a striking long-exposure photo of the spacecraft as it passed over Leiden in the Netherlands. "It is moving very fast, quite a spectacular view," Langbroek told SPACE.com. "It takes less than a minute for it to travel over a significant part of the sky." The key to spotting ROSAT has been knowing where to look, he added. "You have to keep a close watch on the relevant parts of the sky though, as it is gone again before you know it," Langbroek said. German Aerospace Center officials have said they cannot predict exactly where and when ROSAT will fall to Earth, but they do expect at least 30 large pieces of the satellite to survive the fiery re-entry through the atmosphere and hit the planet. Altogether, about 1.7 tons of the satellite debris could rain down over a 50-mile (80-kilometer) stretch of the Earth's surface, German space officials have said. There is a 1-in-2,000 chance that ROSAT debris could injure one of the nearly 7 billion people on Earth, but the actual personal risk per person is extremely remote, they added. "Where any remnants of ROSAT will fall is currently difficult to say, it is most likely that it falls just as UARS in the ocean, because it covers the most area," Vandebergh said. "Though we should watch out, as we could be misled now by the fact that UARS fell in the ocean. Maybe this time it's different."